Our G1BN printed side gusset bag measures 2" x 1 7/8" x 9 1/2" and has a chocolate brown top and bottom. Perfect for candy, cookies, and more. The center of the bag is clear to showcase your items. Gusseted sides expand for your product. 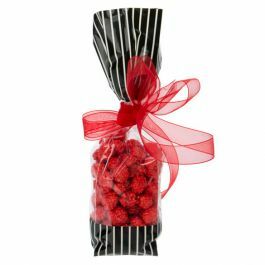 Heat seal or accessorize with a ribbon or tin tie to close the bag. 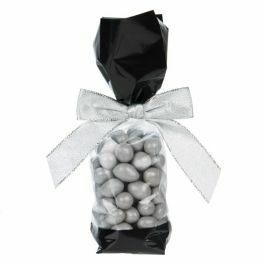 Ideal for lightweight items like candy and favors, our printed gusset bags make celebrating easy. The G1BN has dimensions of 2" x 1 7/8" x 9 1/2" and is printed with a chocolate brown color on the top and bottom of the bag. The center of the bag is clear to showcase your contents. 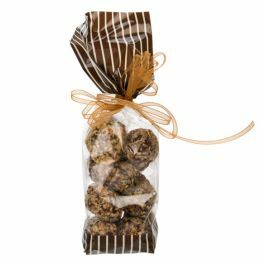 The hint of the rich brown color is perfect for packaging chocolate treats, cookies, crafts, and favors. Printed gusset bags are food safe and heat sealable. Bows, ribbons, and twist ties are a great way to dress up and close the bags. 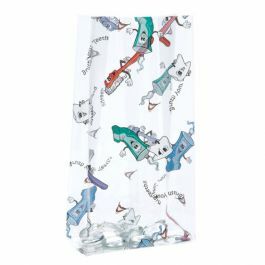 This 1.6 mil bag is made of laminated material for an outstanding presentation and stands upright when filled.